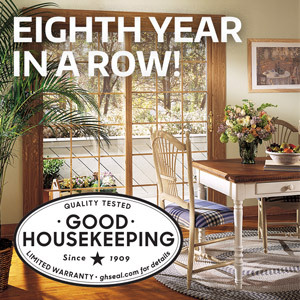 NORTH WILKESBORO, N.C., July 21, 2015 — Window World®, America’s largest replacement window and exterior remodeling company, proudly announces that after rigorous evaluation, its windows earned the Good Housekeeping Seal for the eighth consecutive year. Now in its 20th year of business, Window World continues to build on the quality of products and services it offers, with this latest accolade adding validation that the Window World promise to provide “Superior Products, Professionally Installed, at a Guaranteed Low Price” is a long-term differentiator. To determine whether or not to grant the Seal, The Good Housekeeping Institute (GHI) evaluates safety, performance, ease of use, durability and design. Through this extensive process, GHI goes above and beyond to identify the best products on the market, and then stand behind those findings. Good Housekeeping offers a two-year limited warranty on seal-bearing products, replacing, repairing or providing a refund up to $2,000 for any merchandise found to be defective. This warranty complements Window World’s own lifetime limited warranty, one of the central tenets of the Window World philosophy. Dependable resources like the Good Housekeeping Seal, recommendations from family and friends, and online reviews play an important role in buyers’ purchasing decisions. To assist in making real-life feedback available to all its customers, Window World provides its Window World reviews webpage, sharing hundreds of comments from homeowners nationwide. Helping consumers make informed decisions about their renovations is key to the customer satisfaction that enables Window World to lead the industry and consistently earn accolades like the Good Housekeeping Seal. Window World of Huntsville is locally owned and operated in Huntsville, AL. Window World is an ENERGY STAR® partner and its window products have earned the Good Housekeeping Seal for ten consecutive years. The store, located at 1804 Sportsman Lane NW in Huntsville, AL, serves homeowners in the counties of Cherokee, Colbert, DeKalb, Etowah, Franklin, Lauderdale, Lawrence, Limestone, Madison, Marion, Marshall, Morgan, Rockdale, Winston. For more information about Window World of Huntsville, visit windowworldhuntsville.com or call . Founded in 1885, Good Housekeeping magazine reaches nearly 25 million readers each month, plus another 10+ million online at goodhousekeeping.com. The Good Housekeeping Institute, a state-of-the- art consumer product testing facility launched in 1900 and staffed by engineers and scientists who evaluate thousands of products each year in its six labs, is key to the unrivaled trust that readers and consumers have in the Good Housekeeping brand and the Good Housekeeping Seal. The Seal, introduced in 1909, and the Green Good Housekeeping Seal, created in 2009, are among the most recognized consumer icons and are backed by a limited warranty that provides a replacement or refund for up to $2,000 if a product proves defective within two years of purchase. In addition to its U.S. flagship, Good Housekeeping publishes 10 editions around the world. Hearst Magazines is a unit of Hearst Corporation, one of the nation’s largest diversified media and information companies. With 21 titles in the U.S., Hearst is the leading publisher of monthly magazines in terms of total paid circulation (AAM 2H 2014) and reaching nearly 81 million adults (Fall 2014 MRI gfk) and nearly 44 million site visitors each month. Follow Good Housekeeping on Facebook, Instagram, Twitter, Pinterest and on the Inside the Institute blog.